I love Thanksgiving because it’s such a foodie holiday. Not only that, Thanksgiving dinner is so easy to adapt in ways that makes it hormone-friendly while still being satisfying and delicious. I’m going to share some of my favorite Thanksgiving recipes below, but first I want to explain why the holidays can be so hard on our hormones—and how you can take steps to protect yourself. Now if you read that last paragraph and started panicking because you think I’m about to tell you that you can’t have any of Aunt Julia’s famous caramel pecan pie at Thanksgiving dinner, you’re wrong! When you have a strategic plan for balancing your blood sugar, you can have the occasional sweet treat this holiday season and not feel rotten for weeks afterward. 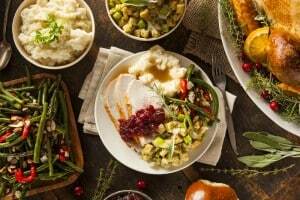 In fact, the holidays become even more fun when you know that you have a strategy for enjoying traditional holiday food without worrying about the hormonal aftermath. So what is it about holiday eating and drinking that can cause crummy symptoms for days, weeks, and sometimes months? It’s all about blood sugar. Balanced blood sugar (not too high or too low) is foundational for optimal hormonal health. When we have extra sweet treats at Thanksgiving, mulled wine all through December (alcohol is processed in the body like sugar), and even more treats (and booze) around the winter holidays and the New Year, it puts our blood sugar on an unhealthy roller coaster. Your delicate endocrine system, which regulates your hormones, interprets mismanaged blood sugar as a stressor and signals your adrenals glands to respond by sending out a lot of cortisol (the stress hormone) and adrenaline. Chronically mismanaged blood sugar, which is triggered by eating too many sweet treats (like we often do during the holiday months) causes your body to be in a constant state of fight-or-flight and sets your entire hormonal system off balance. What’s more, all the extra glucose in your system (and all the insulin that your pancreas releases to deal with all that glucose) disrupts ovulation and interferes with the production of progesterone. This can lead to more estrogen in your body relative to progesterone, a condition called estrogen dominance. Not just that, but fat cells secrete estrogen. The more sugar you eat, the more fat cells you have—and the more estrogen they secrete! This adds to the estrogen overload in your body. 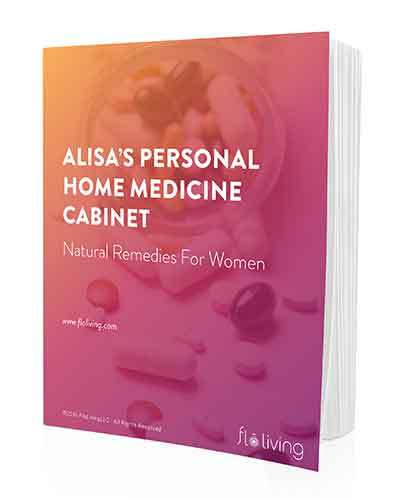 Estrogen dominance is the root cause behind so many period problems and hormonal symptoms, including PMS, cramps, irregular cycles, acne, along with PCOS and infertility issues. So how can you enjoy holiday meals without sending your blood sugar soaring? The secret is pre-planning. And that means being just as intentional about your Thanksgiving breakfast as your Thanksgiving dinner. The right breakfast will set you up for blood sugar success, whether the meal is one you’re making or at someone else’s home. Avocado smashed on Food for Life gluten-free toast with added chia seeds, sesame seeds and Himalayan salt. Over the many years that I have been living in my Flo, I have created go-to recipes that have become traditions for my Thanksgiving table. First up, the turkey question – I usually roast a turkey breast rolled with a stuffing of roasted chestnuts, celery, onions, and herbs. But I also usually like to prepare a lentil loaf (here’s a great recipe) and I make a mushroom gravy to go over the top (here’s an easy recipe, although use coconut or wholegrain flour instead of all-purpose). Then on to the sides – which is where I feel I really shine! Instead of the hormonally hazardous mashed potatoes and bread stuffing or sauce, I make very simple, fresh vegetable blends. I love roasted brussel sprouts and cauliflower mash, but my speciality is something I call “smashed roots.” Delicious. 4 T olive oil or more! Prepare all veggies. In a large pot place 3 inches of water and a steamer basket. Steam all veggies, one root at a time. Smash everything together with the olive oil and salt in your serving bowl and enjoy. Prepare all veggies. Preheat oven to 450 degrees. Bring one medium pot of salted water to boil. Drop parsnips into boiling water for 5 min and place into your casserole/baking dish. In same pot of water, boil green beans for 5 min or until just tender. Finally, blanch the fennel in the boiling water for 2 minutes. Mix everything together with the olive oil and salt in the baking dish and place into the oven. Let roast for 20 minutes until everything is golden and the green beans have a caramelized look to the skin. And for dessert? Glad you asked! No skipping dessert today. It’s the holidays, after all. Instead of pumpkin pie, I opt for a cobbler which satisfies with both its sweetness and crunch. Combine all the ingredients in a 14 inch casserole baking dish. Sprinkle gluten free/sugar free plain granola on top (Udi’s or Elizabeth’s). Cover with aluminum foil. Bake at 350 for 30 min covered. Let sit 15 minutes uncovered and cool. Serve with fresh mint and coconut yogurt or a drizzle of honey. I have to say, my cranberry sauce recipe is amazing – it’s the best one I’ve ever tried. Give it a go! No sugar, of course, but it tastes just as good. How about avoiding the usual cheese and cracker trap with a good appetizer? I have you covered. I love this appetizer and it’s often part of what I take to a dinner at someone else’s home or a potluck or holiday party. It’s really an all-round crowd pleaser. Mix almonds, walnuts, hazelnuts, pecans, maple syrup, cayenne, oregano, sage, thyme, rosemary, savory, marjoram, and oil in a 10- by 15-inch rimmed pan. Sprinkle nuts with 1 teaspoon salt. Bake in a 300° oven, stirring occasionally, until all liquid evaporates and nuts are golden under the skin (break open to test), about 45 minutes. Let cool. If I’m going to Thanksgiving at someone else’s home, I will bring my roasted nut appetizer with me and, usually, also the cobbler. This means I have something to snack on and a healthy dessert, so I skip the cheese and crackers and the pies. I can easily have the turkey and vegetable sides while avoiding the mashed potatoes and bread stuffing, without seeming difficult. Say all does not go according to plan and you need to offset your foodie indulgences…maybe you found it hard to avoid what your host was serving up. Eat a good breakfast (see above!) but keep it super light the rest of the day. Add some turmeric to those eggs and avo toast. This will smooth out your blood sugar and slow inflammation. Have a green juice (½ cup mango, ½ a green apple, 1/2 cup frozen pineapple, 1/2 cup coconut water, 1 cup of cilantro and blend!) and a green salad with leftover turkey slices for lunch. Have a side order of a fresh apple. Add some sauerkraut to that turkey salad to get your probiotics in and further heal inflammation. Take a shot of apple cider vinegar. Sip on hot water and lemon throughout the rest of the day. These will work to emulsify those fats. If you’re needing some health upgrading, it’s time you started looking into what’s going on with your hormones. Great ideas! I’ve lightened up on Thanksgiving throughout the years. Hard to give up a teeny bit of gravy, though. I buy it from Whole Foods and discard most of it. No white potatoes for years, and I make yams but just with a little raw butter or smart balance and a teeny bit of honey. Not sure if that’s Flo-like but the sweet potatoes are almost fine with cinnamon and water and that’s it. Rutabaga! Love that vegetable. Doesn’t need much, just boil it in a teeny bit of water and add some black pepper. Hope everyone has a happy Flo Thanksgiving! Are there more instructions for the cranberry sauce? YES! You cook the raw cranberries in the juices until they dissolve into a sauce, then remove from stove add in honey and jalapeño until desired taste!! Bon App! I have had some recent challenges and pain, and my husband started us on a ketogenic diet. So most likely no Thanksgiving for us. What do you think of that diet? First of all, thanks for this and PLEASE also make one for Christmas recipes(unless you have already done one). There are sooooooooooooooo many hormone-happy-hacks for Thanksgiving. Below are some of mine! -Food Combining! : Simply put, mix carbs with veggies, and protein with veggies. Helps digestion so much! -For Breakfast: Omelettes with LOTS of phase-friendly mix-ins, or coconut flour pancakes, with fruit or pureed, spiced, stevia-sweetened pumpkin on top! For Lunch/or a snack/meal needed before Thanksgiving meal: Totally agree with the avocado toast, the herbaceous roasted nuts, or boiled egg. Thanksgiving: Bring your own gravy, salad dressing, roast lots of amazing veggies with fresh herbs. (Some people don’t do good-for-you veggies on Thanksgiving, so make sure you have some really delicious ones-even if you bring your own) Zucchini or root veggie, low carb fritters(egg/spices/coconut flour/fry in coconut oil). Pumpkin soup spiked with curry powder. Or, bring everything you **need** INCLUDING your dessert to Thanksgiving in another’s home. Dessert: Cobbler-city! Tinker with fruit/oats/nuts/cinnamon/stevia and bake. And there are lots of low-carb/sugar-free pumpkin mug cake/pie recipes out there. Or, save your pre-baked sweet potato for your dessert!